Aerial locomotion can be classified into three types – gliding, parachuting and flying. Only group of mammals, the bats (Order Chiroptera) are capable of true flight sustained by flapping of the wings, but representatives of a number of other arboreal groups (squirrels, possums, colugos) are able to glide or parachute considerable distances through the air. The ability is useful as a means of escaping from predators, travelling from one location to another location, or as part of predatory behavior. 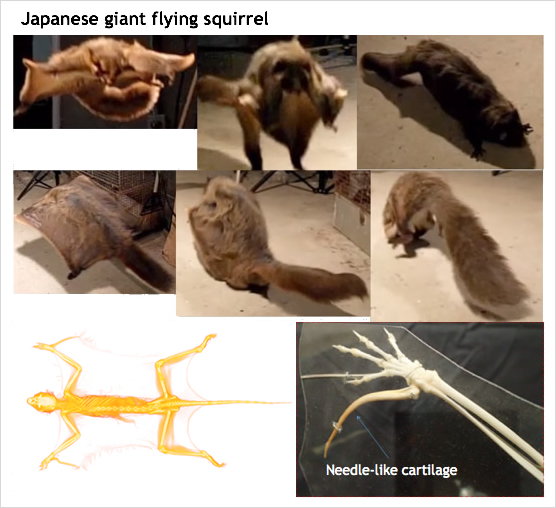 The wings or flight membranes of flying and gliding mammals comprise a web of skin, the pataguim, which is supported by skeletal elements of the limbs and sometimes also the tail. The purpose of a wing is to create lift, while a parachute increases and slows the rate of descent by increasing air resistance or drag. Both lift and resistance are related to wing area and angle, and flying or gliding mammals are able to make postural adjustments in order to control speed and trajectory and to maximize the duration of a glide. All gliding and parachuting mammals are arboreal, and must gain the height required for a glide by climbing. Glides are launched from an elevated position with a jump, then the limbs are extended into the gliding posture to open the flight membrane and allow the animal to control its decent and travel horizontally. The different of wing morphologies of various gliding mammals give each species a characteristic glide pattern, but individuals are also able to control the trajectory of the glide using the limbs and sometimes the tail to adjust the angle at which the patagium meets the air stream. Fig. 29 Note the long limbs and needle-like cartilage to increase the wing area. Bats are the only mammals with flapping wings. The wings of bats comprise webs of skin extended between the elongated fingers of the highly specialized forelimbs and the hind limbs, and sometimes also the bones of the tail. Flapping flight locomotion consists of alternating upstroke and downstroke, and the animal makes further in-flight adjustments to the posture and movement of the wing to control lift and to change direction and speed (ref.5). Fig. 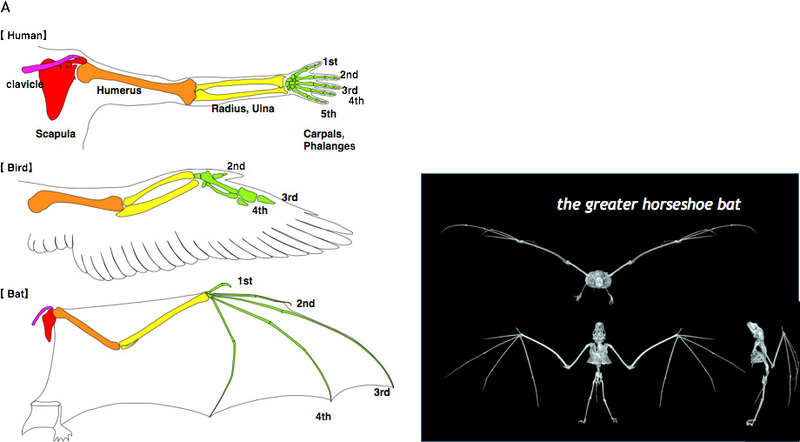 30-2 A:The skeleton of forelimb of human and wing of bird and bat. B:Skeleton of the greater horseshoe bat. (license: Tokyo Zoological Park Society, Ueno Japan),are belonged to Dr. Wada (Chief editor of this website).